If you want roofing in El Campo, TX for an affordable cost, do you know who to call? Contact ECO Commercial Roofing today at (833) 200-0571 for the high-quality roof services you need! We’re experienced in a wide range of roof services, and we take client very seriously. We are participating members of our community, and we’ve been reliable El Campo roofers for a long time now. Our contractors are extremely knowledgeable on the various types of roofing, and we are happy to help you with any of your roofing questions or concerns. For professional, kind, and helpful roofers, you can always depend on ECO Commercial Roofing! A trustworthy contractor is critical when it comes to any services for your home or business. Every one of our contractors goes through training to industry standards, and we make sure to only purchase high quality products from brands such as Conklin. We additionally supply a wide array of roofing options for you to choose from, since your roof can have a large impact on property value. Everyone enjoys a particularly pretty roof, but be sure to consider all of the long term benefits involved, as well. Other factors to think about include your budget, and the kind of building that is requiring the roof. Our crew is glad to provide you with plenty of options. Reliable roof services are our primary priority, and we can deliver that in the form of repairs, replacements, and installations as well. Whether you need help with a business project, an industrial one, or a home one, we can serve you! Our commercial roofing offerings are meant to cater to business owners who have low-sloped or flat roofing systems. When you need your flat roof to endure without any further issues like leaking and ponding, specialized installation will be required. Our industrial roofs, contrarily, are created with particularly strong materials to stand up to the additional wear and tear typically put on a facility roof. For homeowners, we also have a variety of cost-effective residential roof styles that are sure to accommodate your requirements! As roofers that specialize in roofing restoration, we know more than a few techniques to handle roof coatings. By using high quality materials like Conklin, we ensure that your roofing solution will endure for years to come. We’re committed to providing our clients with the very greatest roofing in El Campo, TX, and we deliver that with superior craftsmanship, time after time. If you’re interested in learning more about how roof restoration with Conklin coatings can prolong the longevity of your roof system, give us a ring now at (833) 200-0571, or check out the links below! If you are hoping to fix minor damages on your building’s roof, as well as to protect it from further damages, a roofing restoration is a great place to start. Using Conklin roof coatings, our team of professionals can add another decade to the life of your building’s roof! Save yourself time and money by choosing a quality roof restoration in place of a roof replacement. The main method of roof restoration depends on top quality Conklin roof coatings. Available in a selection of types and purposes, you can rely on our roofers to help you determine which option will work best for you. Different coatings deliver different levels of adhesion, flexibility, and water resistance. 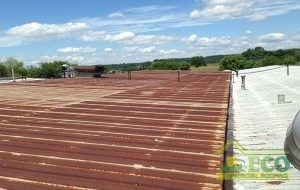 Typically, we can also install the roof coating without removing the previous roofing material. To discover if your roof is eligible for our roof coating, call us today at (833) 200-0571! Acrylic Roofing Acrylic roofing is particularly flexible, and caters well to varying temperature fluctuations. Our flat roofing services are meant to help out several different types of commercial roofing, including low-slope as well as flat roofs. The best way to avoid leaks and ponding is to properly install the roof in the first place, which our professionals can assist you with. If you want your building’s roof solution to work efficiently, and last for a long time, our roofers are ready to help. For all of your reliable commercial as well as residential roof needs, contact the experts at ECO Commercial Roofing! We don’t only provide our expert roofing in El Campo, TX, but additionally in the nearby areas. Every business can hope to gain from the application of a top quality roof investment. Give us a ring today at (833) 200-0571 with roof questions, or if you would like to schedule an appointment with our expert roofers.